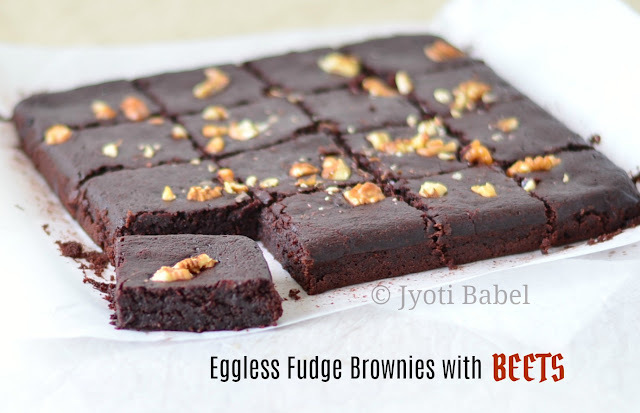 Eggless Fudge Brownie with Beets is a winner recipe. Quite healthy, easy to make and tastes quite awesome. If there is one thing that can make me forget all about conscious eating and diet control – it is chocolate. There are times when I do control myself from having that extra piece of the chocolate bar. But, on most occasions, it has the better of me. That’s why I prefer not having any chocolate bars at home. Perfect solution, isn’t it? The intense chocolate flavour in fudge brownies is perhaps one of the reasons why I prefer them over cake any day. Give me a slice of soft, dense chocolatey brownie and I will wander into my chocolate nirvana. When I saw Srivalli had listed a brownie theme in the 78th edition of the Blogging Marathon, I instantly chose it. Yet, there are so many brownie variations that are on my to-do list. I have seen many brownies with chocolate and beetroot combination doing rounds on the internet. So, I decided to try it myself. I used this recipe for fudge brownies as a standard and tweaked it to come up with this recipe. After having a slice of these beetroot fudge brownies, I realized beetroot and chocolate is a winning combination. There is no trace of any beetroot flavour. Unless you tell anyone, no one will ever make out this secret ingredient in the recipe. I used wheat flour and oil in this recipe to make it even healthier. Check out my recipe below. 1. Line an 8” square brownie pan with parchment paper and set aside. Preheat the oven to 180 C.
2. In a large bowl add atta, maida, cocoa powder, coffee, and baking powder. Use a whisk to mix everything together. Set aside. 3. Chop the chocolate into small pieces and add it to a medium microwave-safe bowl. Microwave it for 1 minute so that it melts. Whisk it to get smooth melted chocolate. To it add oil and stir. Add sugar and stir it again. Now add yoghurt and beets puree and whisk it nicely. 4. Add this wet ingredients mixture to the dry ingredients mixture. Add ¼ cup water and whisk to make a smooth batter. If the batter looks thick, add another ¼ cup water. Pour the batter into the prepared tin and top it with chopped walnuts. 5. Bake in the preheated oven for 25-30 minutes. When done, a skewer inserted in the middle should come out clean. 6. Let it cool for 10-15 minutes before you can lift it from the pan along with the parchment paper. Slice and serve. 1. To prepare beets puree, I pressure cooked 2 medium beets. When cooled, I peeled and chopped them and churned in a mixer jar to get the puree. 2. For fudge brownies, I prefer lining the tin with parchment. Since fudge brownies are quite soft and mushy, it is easier to lift the brownies out of the tin along with the parchment. 3. Slice them after the brownie has cooled a bit for neat slices. 4. You can do away with the maida in the recipe and add whole wheat flour or oats flour instead. 5. You can also double the beets puree and omit the yoghurt and half the water amount to get red looking brownies. 6. I had run out my regular powdered sugar, so I used 2 tbsp of brown sugar. You can regular sugar too. Talk about this sinful ingredient! Chocolate ! Tell me who doesn't like it ? I like the idea of not keeping it at home ...ha ha , btw the brownie theme is awesome and I love beetroot brownies , they look so good ! Beautiful color and texture . 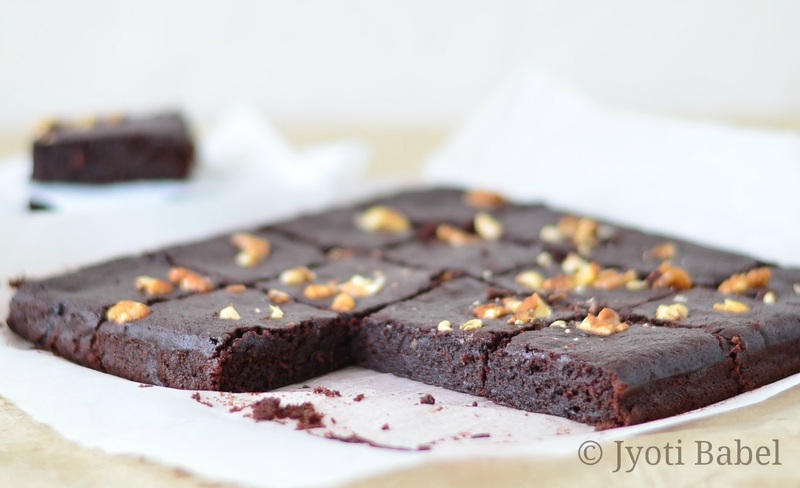 Health and taste packed together in these brownies..Must try these. Never tried brownies with beets. Definitely a winning dish! Bookmarked to try soon.. I have baked with beetroot and chocolate, and like you mentioned, they are amazing together! The beets give it a nice red velvet like color to the bake and just enhances the moistness... amazing looking brownies! Thats absolutely delicious Jyothi. I have tried beets and chocolate, but the combination sounds very interesting! Awesome brownies. I've baked with beet and chocolate combination and love the colour one gets, and amazing softness. I too cannot resist chocolate. Wow those brownies are stunning!..what a texture and I feel like grabbing right off now..Even I have always loved having beets paired with chocolate, makes a great dessert..
That looks absolutely delicious!!! !Awesome clicks!! I am off sweets for one week now, a long time....so this one gets done and soon. Beets in brownies is a healthy and tasty option. Wow that looks sinful!!! Wish i could take some from the screen!